In the first year, we will induct more entrants to help seed the hall (especially since we have had so many decades of quality genre television prior to the opening of this hall of fame). So in addition to the inductee voted on by the listeners, the hosts of TIST, in honor of our third year of production, will each induct three entities to the hall of fame this first year. Therefore a grand total of ten entities will be inducted in this inaugural year. The first ever inductee to the genre television hall of fame is Rod Serling. 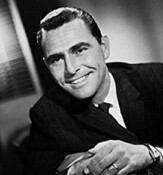 Rod Serling was born in New York in 1924 and passed away in 1975. He began his genre television career by writing 1953’s Nightmare at Ground Zero, an episode for the Suspense anthology series. Mr. Serling was first and foremost a writer. But he may be best known by the public as the host of his ground breaking and inspirational anthology series, The Twilight Zone, and his follow-up series Night Gallery. Gerry Anderson was born in England in 1929. He began his genre television career by producing 1957’s The Adventures of Twizzle and Torchy, the Battery Boy. He went on to produce such classic genre shows as Fireball XL5, Thunderbirds, UFO, and Space: 1999. Mr. Anderson is probably best known for producing shows featuring marionettes. The 2004 feature film, Team America: World Police, by the South Park creators, was clearly a nod to his body of work. But he also produced a number of live action shows. The character of Superman has been present on television since its earliest days. In 1952, George Reeves brought his version of Superman to television screens in all of its black and white glory. After six seasons, Superman flew away to return later in such shows as The New Adventures of Superman, Lois & Clark, Smallville, Justice League, Young Justice, and many Saturday Morning cartoons such as Super Friends. William Hanna was born in New Mexico in 1910 and passed away in 2001. He began his career as a director of animated short films in the late 1930s. Joseph Barbera was born in New York in 1911 and passed away in 2006. He began his career as a director of animated short films in 1940. 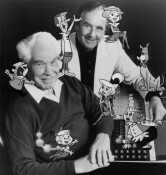 Mr. Hanna and Mr. Barbera have worked together since 1940’s Tom and Jerry animated shorts. But in 1960 the duo began working on numerous classic genre animated shows including The Flintstones, The Jetsons, and Scooby Doo. In 1963, the BBC began airing a children’s program called Doctor Who. Little did the BBC know that Doctor Who would become such a cultural cornerstone for millions of Brittons. And thanks to syndication, many Americans and citizens of Commonwealth countries also had their childhoods touched by The Doctor, his companions, The Master, Daleks, Cybermen, and everything in between. Even before Doctor Who was canceled in 1989, the BBC attempted a spin-off series featuring companions Sarah Jane Smith and K9, the robotic dog, entitled K9 and Company. It never went beyond a pilot. 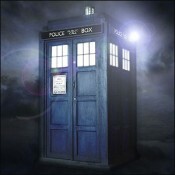 After a failed attempt to re-start the series in 1996 with a television movie, Doctor Who returned in full force in 2005. Soon two spin-off series did make it into production: Torchwood and The Sarah Jane Adventures. Mr. Roddenberry was born in Texas in 1921 and passed away in 1991. He is by far best known for creating the Star Trek universe with the premiere of the ground breaking 1966 series. But he began his career as a television writer in 1954. He went on to produce or have produced in his name all of the Star Trek spin-off series, as well as Genesis II, The Questor Tapes, Earth: Final Conflict, and Andromeda. His legacy continues not only in the memories of millions of people but in the form of new films in the Star Trek universe. The Night Stalker universe began in 1972 with the TV movie entitled “The Night Stalker.” It was followed in 1973 by the TV movie “The Night Strangler.” Finally, in 1974, the universe became a series entitled Kolchak: The Night Stalker. The series ran for one season of twenty episodes. The character of Carl Kolchak reappeared in the short-lived 2005 rebooted series. Rockne S. O’Bannon was born in California in 1955. He first entered the realm of genre television as a writer for the 1985 reboot of The Twilight Zone. Mr. O’Bannon went on to be lead writer on the Alien Nation series in 1989, as well as create the SeaQuest DSV and Farscape series. He remains active today, writing TV movies and contributing to other genre shows. Premiering in 1993 and lasting for nine seasons, this Chris Carter creation inspired a generation of genre fans to believe… and to trust no one. Inspired, to some degree, by the previously inducted Kolchak: The Night Stalker, The X-Files went on to win numerous awards, including several coveted Emmy awards. The program has clearly inspired a new generation of genre television talent and will continue to do so for decades to come. Joss Whedon was born in New York in 1964 and got his start in genre television in 1996 with the small screen adaptation of his feature film “Buffy the Vampire Slayer. ” Mr. Whedon has gone on to create and produce the Buffy spin-off, Angel, as well as the innovative space-based science fiction series Firefly. He was one of the first mainstream entertainment creators to embrace the new medium of the world wide web with the short-form series, Doctor Horrible’s Sing Along Blog. He continues creating genre television today, having recently produced the short-lived Dollhouse series.